The annual en primeur presentation of the 2006 vintage of Brunello di Montalcino last february has already caused widespread controversy even before the wines' official release date. The Brunello di Montalcino Consorzio, eager to present some good news after a very testing couple of years, in which Italy's most famous wine was associated with fraud and illegal blending practices (click on the Brunellogate tag below), has awarded the 2006 five stars, the highest possible rating. Although 2006 was a very good vintage for Tuscany in general, and in some places even outstanding, many journalists present at the two-day en primeur tastings, in which more than 140 wines were presented, were almost unanimous that the wines generally failed to live up to the year's supposedly superior reputation. There was widespread disappointment in the fact that too many of the wines seemed either flabby and lightweight (certainly no attributes for long ageing), or overripe while burdened with green tannins. Another outstanding feature, much speculated on by the assembled press, was the fact that almost all the wines were so much paler (some calling it 'truer') than the 2005s were only a year ago. While many of the reports on these tastings have yet to appear (my detailed tasting report will follow in due course), from day one the Italian and International blogosphere was already buzzing with rumour and speculation as to why a supposedly great vintage has turned out to be of such modest quality in general. At the same time the Consorzio seems unable to let the dust settle on what has come to be known as Brunellogate, with a recent controversial proposal to change the regulations for Rosso di Montalcino from being 100% Sangiovese to allowing the addition of other varieties, mostly international ones. An open letter from one of the region's premium producers, Mastrojanni, was immediately joined by several others, all arguing that this change would 'dilute' the wine and cause the loss of its identity. The disaffected producers also openly question why the Rosso di Montalcino regulations should be changed to accommodate producers who want to use international varieties, when the region already has a DOC, Sant'Antimo, expressly designed for those who wish to do so. At least for the time being it seems as though the Consorzio is listening and has decided to postpone this controversial proposal. 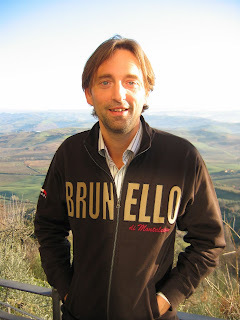 My picture shows German wine writer Steffen Maus, who plans to publish a book on Tuscan wine later this year, modelling the 'official Brunello shirt' left for us wine writers in our hotel rooms this year.